SolveigMM Video Splitter is the video editor to support MPEG-2, AVI, WMV, ASF, MP3, WMA files. The editor fulfills cutting and joining tasks in fast and lossless mode. The nice looking and intuitive user-friendly interface allows movie and video editing in a few mouse clicks. Based on SolveigMM Video Editing SDK, SolveigMM Video Splitter's audio & video editor provides the incredible quality and velocity involving no encoding/decoding operations. 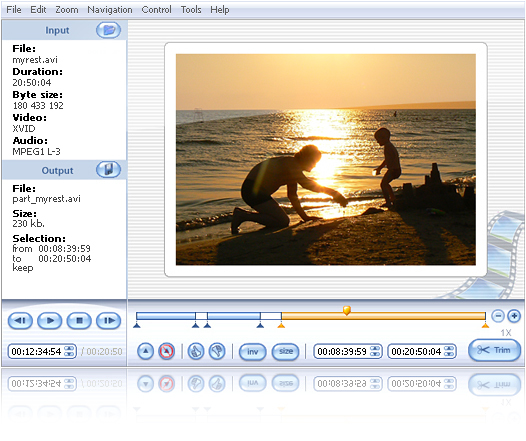 MPEG-2 frame accurate and ASF,AVI,WMV GOP accurate editor. ...... 0 MPEG-2 frame accurate editing added. SolveigMM Video Splitter advanced technology keeps 99% of data and only transcodes some frames in beginning and end of processed media fragments that helps to operate in fast and lossless mode for MPEG-2 files too. o Any video content. DivX; XviD; 3ivX, etc. o Any audio content. MPEG-1,2 Layer I, II, III; AC3; OGG, etc. o Any video content. WMV 1,2,3; MSS2; MPEG-4 AVC, etc. o Any audio content. WMAudio V 2,7,8; MPEG-1,2 Layer I, II, III; AC3, etc. Split,cut or trim a large video file into smaller video clips. help you split,cut or trim a large video file into smaller video clips. Active MP4 Video Splitter can split MP4, MPEG to small pieces fast. Joiner, splitter, converter for the movie files. Qweas is providing links to SolveigMM Video Splitter 2.5.1111.07 as a courtesy, and makes no representations regarding SolveigMM Video Splitter or any other applications or any information related thereto. Any questions, complaints or claims regarding this application SolveigMM Video Splitter 2.5.1111.07 must be directed to the appropriate software vendor. You may click the publisher link of SolveigMM Video Splitter on the top of this page to get more details about the vendor.